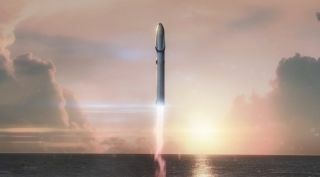 Artist's illustration of SpaceX's BFR Mars rocket lifting off. SpaceX is negotiating with the Port of Los Angeles to build a facility there for manufacturing "large commercial transportation vehicles," according to documents on the Los Angeles Board of Harbor Commissioners website. SpaceX currently builds all of its rockets and spaceships at the company's headquarters, in the Los Angeles suburb of Hawthorne. So speculation is swirling that the new Port of LA facility will focus on the BFR (Big Falcon Rocket, or Big F***ing Rocket), which SpaceX is developing to get people to Mars and other destinations throughout the solar system. "The site is entirely disturbed with abandoned industrial buildings, unused compacted dirt area, and paved areas," read the agenda. "Operation would involve research and development of transportation vessels, and would likely include general manufacturing procedures such as welding, composite curing, cleaning, painting, and assembly operations. The majority of operations would take place inside the facility, with exterior operations limited to transit of vehicles, forklift traffic, and mobilization of manufactured products onto a barge at the dockside for testing and delivery." Last week, the board voted to approve California Environmental Quality Act regulations that are needed before greenlighting the project, the Los Angeles Times reported. The board will later vote on a lease to approve the project, but the date of that vote has not yet been released. The board further states that the project "would not have a significant effect on the environment," but adds it will implement standard oversight measures to ensure SpaceX is compliant with environmental regulations. Falcon Heavy's maiden voyage on Feb. 6 saw the 230-foot-tall (70 m) rocket heft a Tesla Roadster into space. The flight met almost all major objectives, SpaceX representatives said, and the company plans two more launches of the booster in 2018 alone. But the Heavy may not fly for long. In September 2017, SpaceX founder and CEO Elon Musk said the plan is to replace both the Falcon 9 and Falcon Heavy with the BFR system in the 2020s.